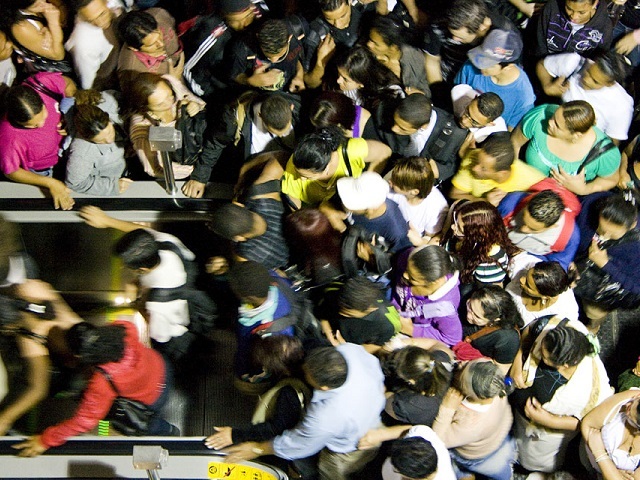 A crowd of passengers attempts to exit a metro station in São Paulo, Brazil. A new innovation from the Santiago Metro may help decrease platform gridlock for passengers like these, making mass transport a more attractive alternative to private vehicles. Photo by Fernando Stankuns/Flickr. Imagine you’re riding in a crowded metro car. It’s so full you weren’t able to get a seat, so you do all you can to stay upright as the train lurches between stations. As your stop approaches, you wonder how you’ll possibly be able to squeeze through the mass of people blocking your way to the car’s exit. Somehow you manage it, but find yourself again trapped in a sea of stalled passengers once exiting onto the platform. Which way do you need to go to find your exit, and how will you fight through the throng of people to get there? For many urban commuters worldwide, this is their daily reality of urban mobility – long lines and short tempers. In a new video released this week, Juan Carlos Muñoz, Director of the BRT Centre of Excellence, addresses a metro platform gridlock like the one just described in Santiago, Chile. The congestion is caused by crowds of riders attempting to exit in different directions, which not only results in unhappy passengers, but also disrupts the system’s capacity to run on schedule. Instead of operating the programmed 24 trains per hour every morning, only 22 trains operate – a capacity loss of about 10%. As Muñoz explains, passengers arriving on the 4 line at Tobalaba station in Santiago exit the train and head in different directions in order to exit the station or transfer to a different line. Their disorderly exit creates gridlock on the metro platform, increasing the time it takes to off board passengers and reducing the frequency at which trains can run. Obviously, this is an inefficient and undesirable situation for both passengers and Santiago metro operators. So how can it be avoided? Check out the video below to see the simple and cost-effective solution to this problem – a solution that allows more trains to service the station, safely carry passengers to their destination, and substantially improve their travel experience. The doors installed by the Santiago Metro help mitigate the counter flow of passengers on the platform. They direct passengers to the stairs located closest to them, which decreases passenger congestion and allows a steadier flow of people and trains through the station. As a result of the installment, Tobalaba station’s capacity has increased by 15% – an additional 4,000 passengers can travel through the station per hour – and user travel time has decreased by 5%. This simple improvement to Tobalaba station is an excellent demonstration of how improving the quality of mass transport systems can have direct, positive impacts on people’s lives. Providing high quality mass transport, be it metro, bus rapid transit (BRT), light rail or otherwise, is the key to making sustainable transport the best choice for urban residents. As Muñoz states in the video, transport systems everywhere are full of this kind of opportunity to improve congestion and lines – it’s time to embrace these opportunities as chances to make mass transport an even more attractive alternative to private vehicles.